This 126 piece set would be a great addition to your clip art collection! 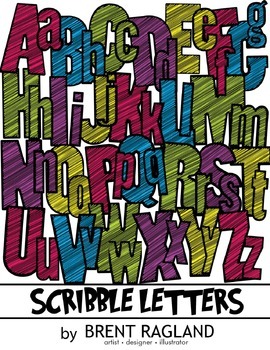 Use these scribbly letters to brighten up your classroom and add color to your projects. You will get the letters A-Z in upper and lower case, as they are shown in the product thumbnail. You will also receive common punctuation signs! A black and white version of each image is included as well, so you can print them and color them however you would like. The images are high resolution PNG files, so you can enlarge them with no problems. Please check out my others products and make sure to FOLLOW ME for more fun clip art and resources!